Andrew Moffitt M.B. 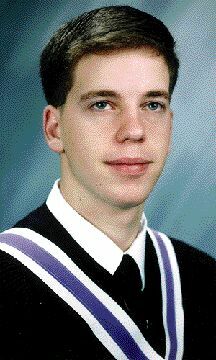 Memorial Web Site: Student dies trying to stop bar fight, Thursday 24 December 1998. City, The Ottawa Citizen Online. Student dies trying to stop bar fight, Thursday 24 December 1998. City, The Ottawa Citizen Online. Andrew Moffitt, 23, died trying to break up a fight. The aspiring computer engineer spent his last hours of life celebrating the end of exams with his friends at their neighbourhood bar and grill. He was to graduate next spring and had a job already lined up. It was Andrew Moffitt's last night in town before Christmas, which he planned to spend with family in Brockville. For his family, the holidays are now the last thing on their mind. "He was every mother's dream and now we've lost him," said his grieving mother, Paulette Moffitt. The life of the 23-year-old student came to a violent end early yesterday when another male bar patron stabbed him in the heart during a senseless fight. Andrew Moffitt died trying to stop that fight. "This guy was a great kid and he was trying to be a Good Samaritan by smoothing out the fight," Det. Dale Hayes said. "For trying to help, he got shanked." The trouble began at about 12:35 a.m. when an argument broke out in the upper level pool room of Coyotes, a popular gathering place for University of Ottawa students on the corner of King Edward and Somerset East. At the time, Mr. Moffitt and his friends were seated on the main floor of the restaurant talking about school and holiday plans. The first dispute was resolved, but a bar manager wanted to speak to the man now suspected in Mr. Moffitt's slaying before he left. When the man was stopped on the main floor, a second argument ensued. At this point, one of Mr. Moffitt's friends came to the aid of the manager but was immediately attacked. Mr. Moffitt rushed to the aid of his friend. He pushed them apart but the man pulled a knife and stabbed him once. Mr. Moffitt lay struggling for life on the floor as panicked patrons tried in vain to stem the bleeding and his attacker fled. He was pronounced dead later at hospital. Four hours later, a 26-year-old man turned himself in to police. At 5:11 a.m., a man dialled 911 from a convenience store on Rideau Street and told police to come and pick him up. The suspect was unco-operative during questioning and refused to say where he ditched the knife. Police are still looking for the weapon. Henry Danninger, a 26-year-old University of Ottawa student, originally from Brockville, has been charged with second-degree murder. The alleged killer didn't know his victim and has no criminal record. Last night, Ottawa-Carleton police detectives were still interviewing several witnesses who saw the last seconds of Mr. Moffitt's life play out. Yesterday morning, a special crew of emergency response officers could be seen combing the streets of Sandy Hill for a weapon. They rummaged through garbage, peeked into back yards, searched under doorsteps and vehicles and up on balconies and used asps to sift through snow in hopes of finding it. At 11:30 a.m., identification officers could be seen photographing a 1989 Mercury Topaz parked along Henderson Avenue, one block east of the bar. Detectives noted a drop of blood in the snow near the vehicle, which was towed at 12:30 p.m. The car belongs to one of the victim's friends. Last night, the victim's family -- devastated by the killing -- gathered at his grandfather's house, where they remembered him as a devoted brother of two who was so close to realizing his goals. "He had everything to live for and he was cut down in the prime of his life," said a pained Marg Beriault, the slain man's grandmother. Drawn tight by their grief, his close relatives were searching for answers to what they called a tragic waste of life. They recalled his days of playing hockey and his more recent achievements as a computer whiz. Family and friends said he was a model son and the apple of his younger brother's eye. Whether it was golf, baseball or computer games, he always made time for his 12-year-old brother, Michael. In the small living room stood a proud grandfather. His eyes welling with tears, Adrien Beriault shook his head and said: "It's very hard to take -- a very hard blow." They said he never got into trouble and was such a committed student that he quit a part-time job to focus on his studies. "He was the kind of guy that everybody loved. He was unassuming and quiet," recalled uncle John Beriault. "Anyone would have been proud to have him as a son or brother," he said. Born in Ottawa and raised in Nepean, Andrew Moffitt -- who overcame a serious heart ailment two years ago -- moved to Brockville about nine years ago after his father, Rodney, landed a job as a sales representative for a major food company. He returned a few years ago to study computer science at the University of Ottawa, where he was a hard-working student who achieved honours. Det. Hayes will be working the case again today in the hopes of tying up loose ends. He says it's the least he can do for a family suffering greatly at this time of year. The slain man is survived by two brothers, Michael, 12 and Rodney Jr., 27. His parents Paulette and Rodney Moffitt, who travelled to Ottawa yesterday after hearing the terrible news, were headed back last night to Brockville, where their son's funeral will be held next week. "He was our easygoing son. The kind of guy who would give you the shirt off his back without thinking twice. The whole family is broken-hearted," said his sobbing mother. "People should know that he contributed greatly to society," she said. The mother of the alleged killer, reached last night in Brockville, declined to comment on Ottawa's second homicide this year.